The Department of Library & Information Science (#citylis) is looking forward to hosting the next unconference for health and science libraries. City University London’s Department of Library & Information Science (#citylis) will host HASlibcamp, on 23rd April 2016. The Library Camp ‘Unconference’ sessions take place from 10am to 5pm, College Building in rooms A107, A108, A109, A110, A11 and A112. It will be a day of workshops and discussion where people interested in health and science library and information services can connect, develop new ideas, encourage interdisciplinary thinking, learn new skills and have fun. 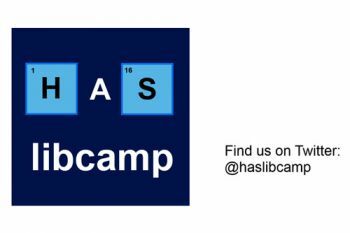 HASlibcamp’s objective is to bring together people interested in health and science librarianship who would like to examine new and existing ways of promoting access to and use of information in libraries and other information environments. There have been many developments in health and science information over the past couple of years, including moves to digital scholarship, research data management, open science, open access publishing, mobile information resources, critical appraisal, personal healthcare apps, and big data. HASlibcamp will offer an informal arena where participants can hear about and discuss the challenges and opportunities that these and other drivers for change bring. As with other library sectors, health and science faces satisfying increasing demand with a decreasing budget, demonstrating impact in the electronic age, justifying the library’s existence, finding time (and the training budget) to learn new skills. HASlibcamp is a conversation for everyone and anyone interested in health and science libraries, this includes: academic, public, NHS, non-NHS, small specialist libraries, library students, or anyone who is keen to learn about health and science libraries. The day will feature hands-on activities and participants are encouraged to bring their laptops with them. Guest Wi-Fi and Eduroam will be available. Last year, #citylis hosted the highly successful #citymash unconference, and Head of Library & Information Science at City, Dr Lyn Robinson, says she is "delighted for #citylis to continue to play a key role in forging links between the library school curriculum and professional practice." #citylis alumna, and current librarian, Kathryn Drumm, writes about last year’s #citymash on the #citylis blog. Current #citylis research student and librarian, Ludi Price, writes about the value of sharing, outreach and unconferences, here.